Mathematical models may be a lot of fun, but when you use them to project the future of our civilization the results may be a bit unpleasant, to say the least. That was the destiny of the first quantitative model which examined the future of the world system; the well known "The Limits to Growth" study, sponsored by the Club of Rome in 1972. This study showed that if the world's economy was run in a "business as usual" mode, then the only possible result was collapse. This kind of unpleasant results is a feature of most models which attempt to foresee the long term destiny of our civilization. Not that it should be surprising considering the speed at which we are wasting our natural resources. Nevertheless, whenever these studies are discussed, they generate a lot of criticism and opposition. It is the result, mainly, of emotional reactions: there is nothing to do about that, it is the way the human mind works. But let's try to put aside emotions and examine a recent study by by Motesharrei, Rivas and Kalnay (MRK) on the destiny of human society that became known as the "NASA funded model" after a note by Nafeez Ahmed. The model has attracted much criticism (as usual) but it is worth looking at it with some attention because it highlights some features of our world which we should try to understand if we still think we can avoid collapsing (or at least mitigate it). The MRK model has this specific feature: it divides humankind in two categories, "commoners" and "elites", assuming that the first category produces wealth while the second doesn't. In some assumptions, it turns out that the elite can completely drain all the resources available and bring society to an irreversible collapse, even though the resources are renewable and can reform the initial stock. So, let me try to rework the MRK model; simplifying it a little and making it more streamlined. Instead of speaking of "elites" and "commoners", let us speak of two different kinds of capital. One kind we call "productive", the other "non productive". Capital is the result of the exploitation of natural resources. "Productive" capital is the kind that leads to further exploitation and growth of the economy; the other kind is capital which is simply wasted. Let me explain what I mean with the example of Easter Island's economy, productive capital is the agricultural structure, while non-productive capital is the Moai building structure. Agriculture sustains people who cultivate more land. Moai building doesn't do anything like that - it is a pure waste of resources and human labor. In our times, we can say that the productive capital is everything that exploits the available resources, from refineries to fishing boats. The non-productive capital is everything else, from private yachts to battle tanks. So, can we build a model that includes these elements? Surely we can; here is a version of the model in the style of "mind sized" models. (done using the "Vensim" software). 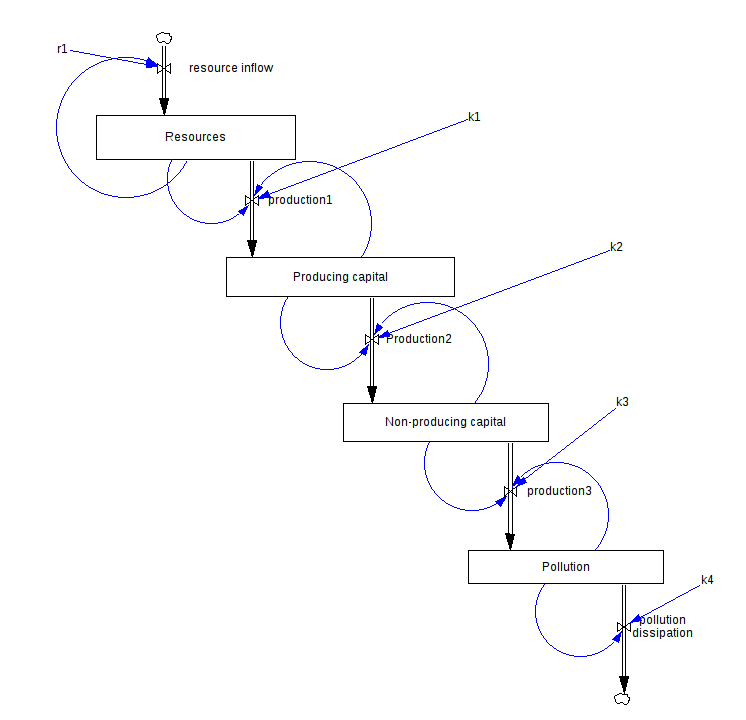 The model is a streamlined version of the MRK model, where I added a "pollution" stock (missing in the MRK model) and where I simplified the productive cascade structure. It would take some time to explain the model in detail and there is not enough space here. 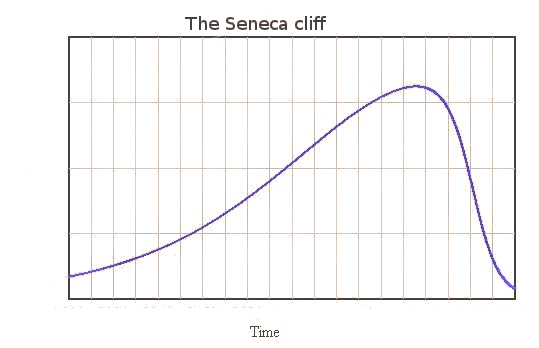 If you want to go more in depth in this subject you can read my paper on "Sustainability" or this post of mine with the rather ambitious title of "peak oil, entropy, and stoic philosophy." But, please, understand that the model, though very simplified, has a logic; what it does is to describe the degradation of the thermodynamic potential of the starting resources (the first box, up left) into a series of capital reservoirs which, eventually, dissipate it in the form of pollution. The "Ks" are constants which determine how fast capital flows from one stock to another. The arrows indicate feedback: we assume here, for instance, that the production of industrial capital is proportional to the size of both the resources and capital stocks. Now, let's go to the results obtained with some values of the parameters. Let's take r1=0.25, k1=0.03, k2=0.075, k3=0.075, k4=0.05. The initial values of the stocks are, from top to bottom, 5, 0.1, 0.1, 0.01 - you may think of the stock as measured in energy units and the constants in energy/time units. With these assumptions, the model produces the same phenomenon that MRK had observed with their model. That is, you observe the irreversible collapse of the system, even though the natural resources reform, becoming abundant as at the beginning of the cycle. You see? Producing and non-producing capital (which MRK calls "commoners" and "elites") both go to zero and disappear. But note how the natural resources reform and return to their former value (actually higher than at the beginning!). This civilization had destroyed everything and won't restart to accumulate capital again for a long, long time. Note also how these results depend on the assumption that non-producing capital cannot be turned into producing capital. It is maybe a drastic simplification, but it is also true that turning swords into plowshares is a nice metaphor, but not something easily done. At this point, let me say that this post is just a sketch. I can tell you that it took me about 15 minutes to write the model; a few hours to test it, and about one hour to write this post. So, these considerations have no pretense to be anything definitive: the model needs to be studied much more in detail. When I have time (and as soon as I can fix my cloning machine) I would like to write a full paper on this subject (anyone among the readers would like to give me a hand? Maybe someone with a better cloning machine than mine?). Nevertheless, even though these results are only preliminary, I think that the fact that the MRK results are so easily reproducible indicate that there is something there. They seem to have identified a feature that, so far, most models had neglected. Although you can always accumulate capital by exploiting natural resources, the final outcome depends a lot on how you spend it. The model tells us, for instance, that a popular recipe to "save the economy" by "stimulating consumption" may actually destroy it faster. So, are we destroying ourselves because we are wasting our natural capital in useless tasks, from battle tanks to SUVs? (and lots of bureaucracy and an overblown financial system, too). Are we destroying our civilization by building these useless structures just as the Eastern Islanders destroyed themselves by building Moai statues? It is something we should think about. 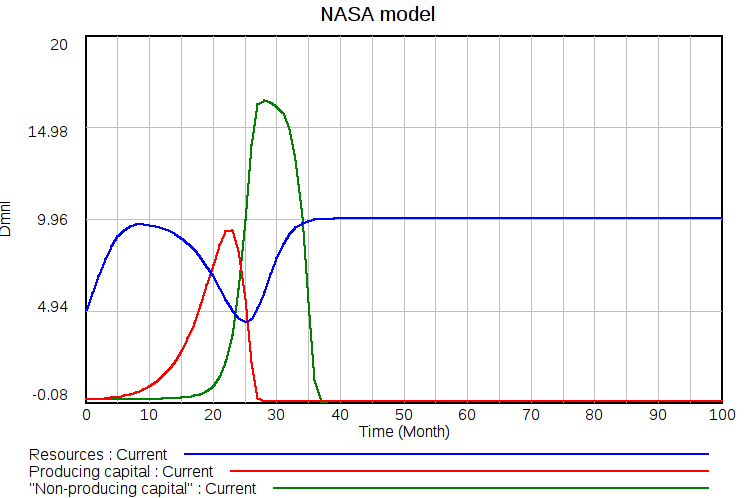 Note 1: I think this model has a lot to do with Tainter's idea of the "declining returns of complexity, if we take "complexity" to mean that lots of resources are used to build something that produces nothing. I already tried to model Tainter's idea with a mind-sized model in a previous post of mine and I am sorry to see that Tainter didn't like so much the MRK model. But I think it is mostly a question of different languages being used. 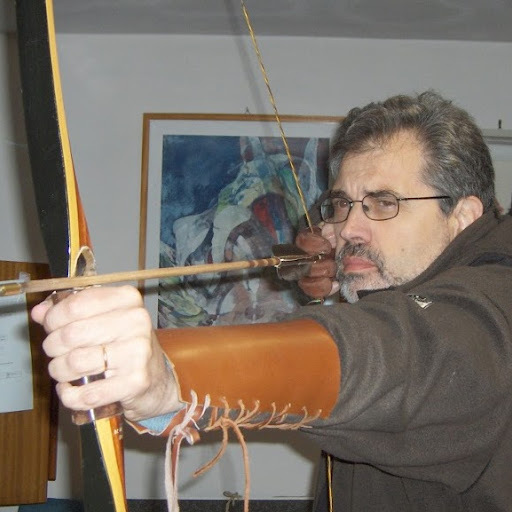 If we work on communication, I think it is possible to find a lot of points of contact in the different approaches of modelers and historians. I think models like these or those in "Limits to Growth" are useful Thought Experiments but they do not reflect the actual processes of societal, economic, ecological breakdown. (Notice how IPCC climate models get the Big Pic right but not (all) the details: speed of arctic icecap melting, for example). The authors of "Limits to Growth" noted this problem: at some point societal breakdown, which is chaotic and unpredictable, would set in an invalidate the mathematical models employed. People, for example, can take anticipatory actions before Post Peak Oil devastates our economies. They can establish "cultural refugia" to preserve what is worth preserving in our civilization. What effect these - and other attempts to build community / regional resiliency such as Transition Initiatives - will have in the mid to long term is anyone's guess. In our times, we can say that the productive capital is everything that exploits the available resources, from refineries to fishing boats. I am quite sure that Refugia are being built by the non-productive elite! With my applied mathematics background I found this (and MRK paper) very interesting. I'd love to dig into it further - perhaps I can borrow your cloning machine when you're done with it? I read through the criticisms you link to but there seemed very little criticism of the model. Most criticism seemed to be of the introduction and output of the model - not much criticism of the details of the mechanics of the model. Fair bit of criticism of the Gaurdian coverage which is irrelevant to the validity or value of the model. The comments by mtobis I think sum up matters quite well. Does these models take in consideration price changes ? Civilizations that collapsed from resource depletion usually had planned/tribal economies and no price incentives. I do not know better way to reduce water shortages than to raise prices of water, for example. I would love to play with this model. The result you have is very interesting, but the questions that pop immediately to my mind are: How does it behave with different values of the constants? Are the combinations that produce stable/metastable/cyclical results? Can we come use this to come up with practical rules like "no more than 25% of capital can be non-productive" or "we can only extract 10% of available resources"? I'm afraid, however, I don't even know what a cloning machine is, so I can't be of much help. "So, are we destroying ourselves because we are wasting our natural capital in useless tasks, from battle tanks to SUVs? (and lots of bureaucracy and an overblown financial system, too). 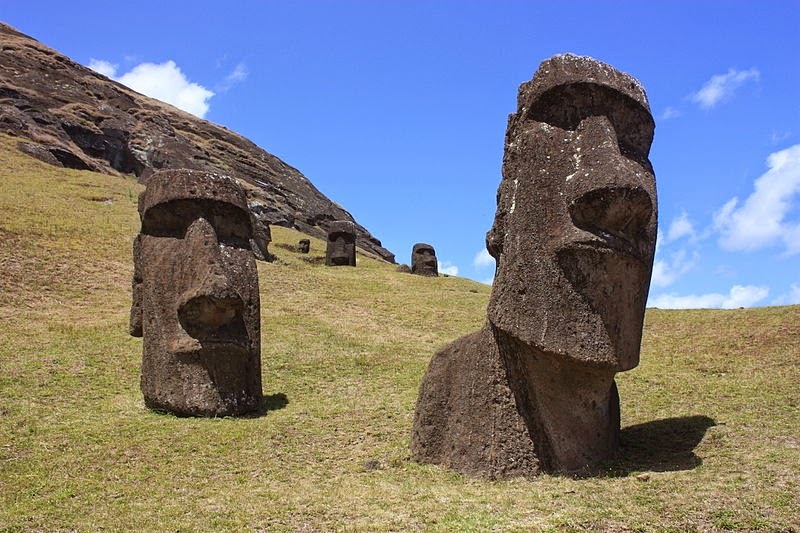 Are we destroying our civilization by building these useless structures just as the Eastern Islanders destroyed themselves by building Moai statues?" The World’s First Sustainable Development Decision Model is symbolized as a geometrical algorithm that balances and integrates the triple-bottom line needs of people, planet and profit into a holistic, fractal model that becomes increasingly detailed, guiding effective decisions throughout the community planning, financing, design, regulating, construction and maintenance processes while always enabling project context to drive specific decisions.